Another North young gun has extended his contract at Arden St with Taylor Garner agreeing to a further two-years - as exclusively revealed by the club’s True North members’ magazine. 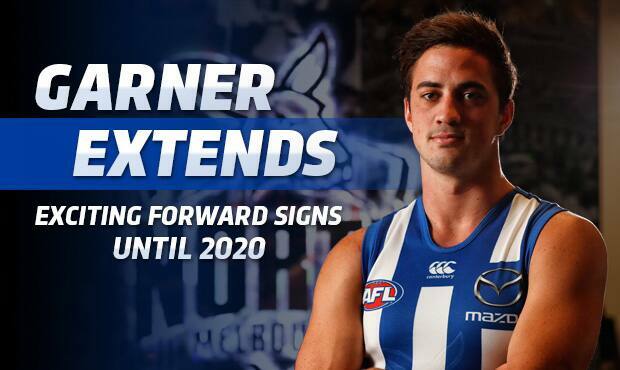 The new deal means the exciting Roo with be at North until at least the end of 2020. The news comes off the back of Garner’s most promising season in 2017 which saw him play a career-high 18 games. "It was rewarding to finally be able to put some games together and repay the faith the club had placed in me. Now they'd be right to expect even a bit more ... and being a competitor that hates losing, I'll be expecting a lot more from myself," Garner told True North. The 24-year-old says he'll be heading into the season with a new level of confidence. "I'll definitely be eyeing some time in the midfield and really want to take my game to the next level," he said. "I'll be hoping to offer some more flexibility to Brad [Scott] and the side by being able to play on the ball, in the forward line or even on a wing." After playing 34 games in No.27, Garner will switch to No.6 – the jumper left vacant by Lachlan Hansen and also made famous by past greats including Arnold Briedis, John Dugdale and Shannon Grant.